If you're a huge fan of astrology, or makeup, in general, chances are you've Googled a zodiac sign-inspired makeup tutorial or two to find out how you can perfectly emulate your star sign. 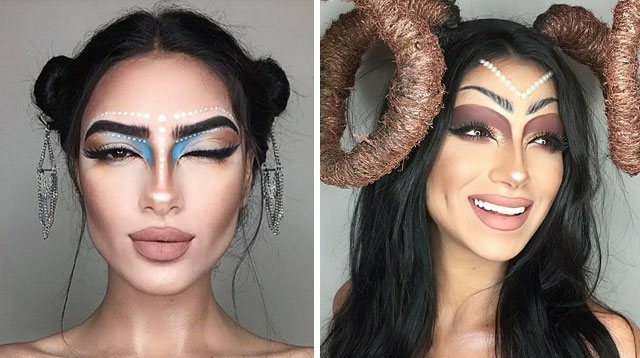 Well, you won't have to look any further as Toronto-based makeup artist Setareh Hosseini, aka @starlit_makeup on Instagram, slayed her astrology-inspired looks. She created one for each of the 12 signs and even included traits that describe what they're known for! Passionate and fierce, Aries is a true-born leader that is always driven and ready for anything. Taurus is strong-willed and loves everything that excites her. But don't get on her bad side as she can unleash her fiery temper! Forever a contradictory sign, Geminis are known for their intelligence, wit, and eloquence. A sensitive sign, though she won't show it; Cancer is always armed with a tough exterior, but will reveal her true self if you gain her trust. Glowing and the most confident of them all, Leos are the true alpha females. Virgo's innocence shouldn't fool you as she's clever and analytical deep within. The perfect balance of logical and emotional, life without Libra simply wouldn't be fair. You'll never be able to look away from a Scorpio's deep and powerful gaze. A nomad, Sagittarius is always looking for the next great adventure, symbolizing her desire for direction and a higher purpose in life. Determined and ambitious, no problem is ever too challenging for a Capricorn. Unpredictable and rebellious, Aquarius lives for the rush of creativity and genius. Forever a mystery, Pisces is the closest thing to a nymph with the ethereal vibe she constantly gives off.